Is Conservative Christian Group, No Greater Joy Ministries, Pushing Parents to Beat Kids to Death? Paradise, Calif. (CBS/AP) Prosecutors say that earlier this month Kevin and Elizabeth Schatz of Paradise, Calif., beat their 7-year-old daughter to death with quarter-inch plastic tubing because she mispronounced a word. They say the girl's parents held her down and whipped her for hours causing massive tissue damage that resulted in her death. "It was torture," says Butte County District Attorney Mike Ramsey. The girl's sister was also allegedly beaten with tubing. She survived. On February 26, 2006, 4-year-old Sean Paddock died in Raleigh, N.C. He had been beaten with plastic tubing as a punishment. When that didn't work, his mother Lynn wrapped him in blankets so tightly that he suffocated. She was found guilty of murder. Photo: Web site of No Greater Joy Ministries. These two families don't seem to have come up with their notions of discipline on their own. Both say they were inspired by a Christian group with nonprofit tax status, No Greater Joy Ministries. No Greater Joy Ministries takes the Bible's notion that "He that spareth his rod hateth his son" as an edict for child-raising, or, as the ministry's website phrases it, "child training" via "biblical chastisement." The Ministry's website says that "Proper application of the rod is indispensable to communicating the divine principle of retributive justice," and that people who avoid using the rod might be "emotional coward[s]." An e-mail to No Greater Joy Ministries by Crimesider was not returned. 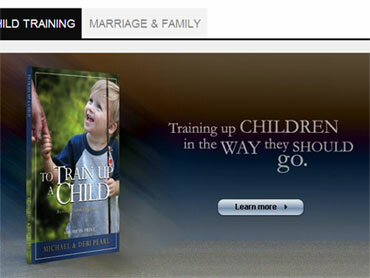 Run by Michael Pearl, a pastor in Tennessee, and his wife Debi, the ministry's website boasts that the Pearls' first book on how to properly beat children, "To Train Up a Child," has over 450,000 copies in print. The ministry's website is quick to point out that beatings should not be administered when parents are angry or to the extremes allegedly found in the Schatz case, but given these two deaths, perhaps No Greater Joy Ministries could take some time to dwell on another Bible verse: "Wilt thou also destroy the righteous with the wicked?"